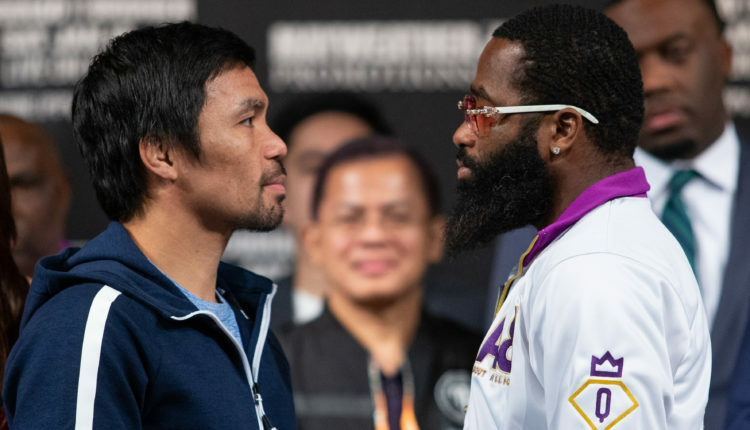 On Wednesday, Manny Pacquiao and Adrien Broner spoke to the press one final time before their WBA “regular” welterweight title showdown on January 19th. Speaking on how he won the title from Lucas Matthysse, Pacquiao told reporters that he feels like his old self. “The knockout in my last fight felt good. It felt like my younger days against Ricky Hatton, Miguel Cotto and others,” Pacquiao would say in Las Vegas.. That fight was a big challenge for me to recover from the fight against Jeff Horn. People said that my career was done. But I never got discouraged, I just worked hard and made the knockout against Lucas Matthysse happen. Being “written off” following his loss to Jeff Horn was a “good” thing for Pacquiao, and looks to use lessons from his losses to push him forward. “I know he is going to counter me but we’re ready for that,” Pacquiao said of Broner. “What happened in the Juan Manuel Marquez fight will not happen again. It was a mistake and I learned that mistake. We’ve worked on that in this training camp. I am prepared for Broner’s style. “He doesn’t remind me of any past opponents just like I’m not going to remind him of anyone he’s fought,” the Ohio native said. “He’s never fought anyone like me. Every fighter has similarities, but truly every fighter is different. If I remind him of Floyd Mayweather, I hope his arm doesn’t hurt after this one. “Manny Pacquiao has done a lot for the sport. I’m going to beat him up and have a drink with him afterward. I grew up in boxing and I know what’s going on. It’s a business, but don’t get it twisted, I’m going to dominate and win,” the challenger said of the champion. Pacquiao-Broner headlines a pay-per-view card on January 19th from the MGM Grand Garden Arena in Las Vegas, Nevada.